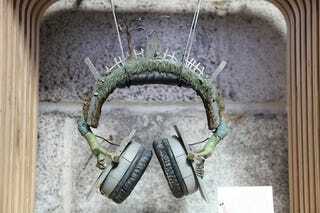 One of a kind Thriller themed headphones. Amazing geek gadget and console themed iPhone cases! Classic arcade games! Some with beer kegs inside! We have Beatles Rock Band going, the new Halo game—on a 103-inch Panasonic plasma TV. Live musical Tesla lightning coils! Palm, Apple, RIM, HTC and more: The greatest smartphones of our time, together in a live Battlemodo of your own devising. MakerBot: The only open source 3D printer to play Daft Punk tunes. The ChefStack machine spits out 200 pancakes per hour, all you do is add batter and press Start. Apple created this console for Bandai in 1996—42,000 units sold, and the product was killed. Come marvel at Apple's biggest failure. Feeling inspired? Why not make some magic on our Lego wall? We have 30,000 bricks at your disposal, and plenty of space left for your brick mastery. Try your hand at shredding on the Prism Laser Synth-Guitar. It bleeps and bloops with the best noisemakers out there. 3D Etch-a-Sketch: All those linear childhood imaginations come to life, now in three dimensions. The Jackoon Artbot spits roams around its canvas, dropping paint spots as it sees fit—ultimately acting like a robotic Jackson Pollock. Pioneer's freshly unveiled CDJ-2000, the latest and greatest in CD Turntables. DJs, come give it a hands-on for yourselves.